These tours are limited to 12 travelers. Paying the $500/600 USD deposit will reserve your space. *If you prefer to mail a check, please CONTACT US so that we know you are registering and can reserve your place on the tour. The payment schedule and Refund Policy are below the registration information on this page. It will also be printed on your invoice. $4,095 USD per person in DOUBLE Occupancy, November 10-24, 2019. $4,295 USD per person with SUITE (4 nights) on the boat, DOUBLE Occupancy, Nov 10-24, 2019. EARLY BIRD DISCOUNTED PRICE: Paid by check in full by July 10, 2019. The Suite has a small balcony and 1 large bed. $4,295 USD per person in DOUBLE Occupancy, November 10-24, 2019. Balance Paid AFTER July 10, 2019. Due by Sept 10, 2019. $4,495 USD per person with SUITE (4 nights) on the boat, DOUBLE Occupancy, Nov 10-24, 2019. Balance Paid AFTER July 10, 2019. Due by Sept 10, 2019. The Suite has a small balcony and 1 large bed. The Suite has a small balcony and 1 large bed. $4,695 USD per person in SINGLE Occupancy, November 10-24, 2019. $4,995 USD per person in SINGLE with SUITE (4 nights) on the boat, Nov 10-24, 2019. $4,895 USD per person in SINGLE Occupancy, November 10-24, 2019. $5,195 USD per person in SINGLE with SUITE (4 nights) on the boat, Nov 10-24, 2019. $4,195 USD per person in DOUBLE Occupancy, Feb 23 – March 8, 2020. EARLY BIRD DISCOUNTED PRICE: Paid by check in full by Oct 22, 2019. $4,395 USD per person with SUITE (4 nights) on the boat, DOUBLE Occupancy, Feb 23 – March 8, 2020. EARLY BIRD DISCOUNTED PRICE: Paid by check in full by Oct 22, 2019. The Suite has a small balcony and 1 large bed. $4,395 USD per person in DOUBLE Occupancy, Feb 23 – March 8, 2020. Balance Paid AFTER July 10, 2019. Due by Dec 22, 2019. $4,595 USD per person with SUITE (4 nights) on the boat, DOUBLE Occupancy, Feb 23 – March 8, 2020. $4,795 USD per person in SINGLE Occupancy, Feb 23 – March 8, 2020. = Singles for the entire tour are SOLD OUT = If you choose this option, you must be willing to SHARE A CABIN for the 4 nights on the Nile boat and have a SINGLE for 10 nights in the hotels. $5,095 USD per person in SINGLE with SUITE (4 nights) on the boat, Feb 23 – March 8, 2020. $4,995 USD per person in SINGLE Occupancy, Feb 23 – March 8, 2020. $5,295 USD per person in SINGLE with SUITE (4 nights) on the boat, Feb 23 – March 8, 2020. Balance Paid AFTER July 10, 2019. Due by Dec 22, 2019. The Suite has a small balcony and 1 large bed. The Suite has a small balcony and 1 large bed. You are encouraged to purchase Travel Insurance to protect you from losses. All cancelations must be made in writing and received by us by the following dates. If we receive a notice of cancellation from you 120 or more days before the tour begins we will return to you all monies received by us from you minus a $250 nonrefundable registration fee per person. If we receive a notice of cancellation from you 60-119 days before the tour begins we will return all monies received by us from you minus $500 US per person. If we receive a notice of cancellation from you 32-59 days before the tour begins we will return all monies received by us from you minus $1,000 US per person. If we receive a notice of cancellation from you 10-31 days before the tour begins we will return all monies received by us from you minus $2,000 US per person. If you cancel 9 days or less before the tour begins there will not be any reimbursement by us to you. Travel insurance is available to prevent such losses. Your payment of the $500/600 deposit constitutes an agreement to pay the remainder of the tour cost before the payment due date. The due date is 2 months before the tour begins in Cairo. For the Early Bird discount, the deadline for payment is 4 months before the tour begins in Cairo. The balance is to be paid by check for USA residents. Non-US residents, please contact us for other payment options. In the unlikely event that a tour is canceled, you will receive a refund of all fees paid to us. Refunds will be made in the same form as the payments made – credit card payments by credit card refund, checks by check. 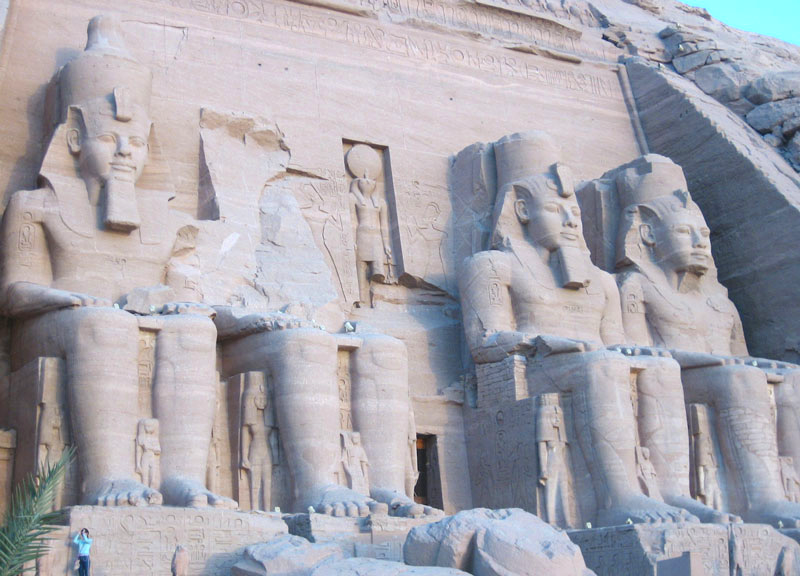 The Abu Simbel Temples are the final ones we visit on this tour. Note the tiny person in the bottom left side. Photo by Ruth Shilling.